In a landmark victory for Hong Kong people after the democratic Umbrella Movement, the movie “Ten Years” won Best Film at the 35th Hong Kong Film Awards (HKFA) last week (April 3, 2016). “Ten Years” is an independent film that features sensitive issues such as the National Security Act and “mainlandisation.” Hong Kong people eventually chose “Ten Years” as the best film in spite of the blackout imposed by the Chinese Communist Party (CCP) to block the movie in mainland China. Since the CCP established its regime, significant historical events have often unfolded with the advent of a movie. The sensation stirred up by “Ten Years” may forecast huge changes in Hong Kong. 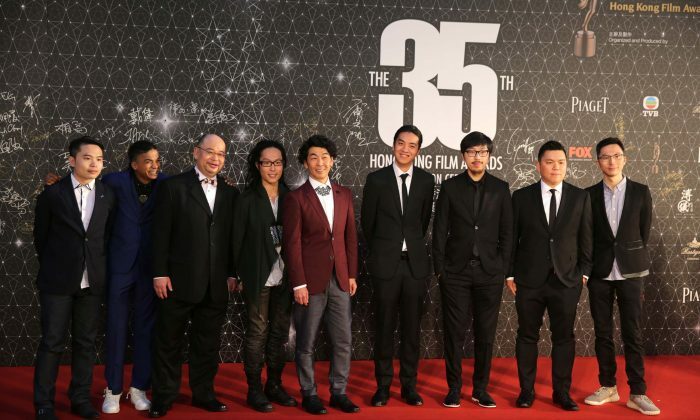 The movie’s winning the award coincided with Chief Executive Leung Chun-ying’s endeavour to realize his “Ten-Year Dream”. Some commentators pointed out that “Ten Years” is a microcosm of the chaos resulting from the CCP’s ruling Hong Kong after 1997. The top prize given to “Ten Years” will undoubtedly turn out to be a cold shoulder given by the Hong Kong people, who say “No” to the CCP and to Leung’s governance. Founded in 1982, the HKFA is one of the most prestigious Chinese film awards and greatly inspires the creation and production of good films. It consists of more than 20 groups of judges, and up to 1,000 voters participate in the election. In recent years, because the film industry has been moving northward and closer to mainland China, the HKFA has also been accused of biased assessment. For example, in 2012, a hot nominee, “Let the Bullets Fly”, which featured sensitive topics and made innuendos to the CCP, unexpectedly failed. In the 2014 award ceremony, an intentional omission of the 1989 Tiananmen Square Student Movement from a playback of Maggie Cheung’s movie clip was suspected to be self-censorship. However, “Ten Years”, a low-budget independent film that the CCP considers a thorn in its side, defeated blockbuster films and unexpectedly won the Best Film Award, achieving a miracle in the film industry. Chip Tsao, a well-known critic, believes that while the CCP tried all means to suppress “Ten Years”, the award won by “Ten Years” proved to be a great rebound in the film industry and was supported by many people. Tsao thinks it is apparent that many people supported this film, including those doing business and making films in mainland China; otherwise the film would not have been able to win, because the CCP sent out so many signals of disliking this movie. The film was not even nominated, Tsao said. Film reviewer Sunny Chan Wing-sun said that those judges who usually do not speak out dared to make a “political statement,” which showed that localism and anti-communism have gained support from the people. The event also indicated that there is a new way out for those who abandon the mainland market. Commentator Lai Chak-fun believes that “Ten Years” gained the public’s sympathy mainly because it expressed the thoughts of Hong Kong people. “The more you suppress, the more they resist. If not for the pressure from the mainland and the Hong Kong government, how could a so-called ‘Hong Kong Independence’ movement arise? The people felt the sabotage of Hong Kong’s core values in person. Leung Chun-ying’s greatest evil is to sabotage the system of Hong Kong,” Lai said. Before the HKFA Presentation Ceremony, Financial Secretary John Tsang Chun-wah published an article titled “Support Hong Kong Films” in his blog. At the beginning of the article, he talked about the Awards. He also clarified the public impression that he loved the French film. “In fact, just like many movie fans, I like most Hollywood movies and Hong Kong films,” he wrote. Tsang emphasized his longing for Hong Kong-made films with the characteristics of Hong Kong. “Ten Years” has been described as Hong Kong’s “prophecy.” About six weeks after the film was released at the beginning of the year, the box office achieved a success, which attracted denouncement by the CCP mouthpiece Global Times. However, when Tsang published “The 2016-17 Budget” in February, he indicated his support for Hong Kong movies. He also frankly told the public that he had watched “Ten Years”. Tsang said the movie was produced by five new directors whose skills are relatively immature and have room for improvement, and some scenes are a bit exaggerated. As CCP leader Xi Jinping shook hands with Tsang during his visit to Beijing last year, Tsang was believed to be “hand-picked” by Xi to be a hot candidate for the next chief executive. Late last year, Tsang took the initiative in addressing the mind-set of “localism” in a blog. He pointed out that Hong Kong people’s affection for and pride in their own identity, traditions, and culture can be turned into a positive energy to propel Hong Kong forward. This opinion significantly differs from the conflict-provoking criticism of “localism” that has been given by Leung and the CCP mouthpiece media. Since last month, the controversy over Hong Kong independence has been stirred up again. However, there have been subtle changes in the attitudes within Hong Kong’s pro-establishment camp. In March this year, the Hong Kong National Party (HKNP) was established and openly advocated Hong Kong independence. The mouthpiece of the CCP and some members of the Hong Kong pro-establishment camp condemned it again in recent days. However, Elsie Leung, the Deputy Director of the Hong Kong Basic Law Committee, explained that no one ever said it is not allowed to discuss Hong Kong independence. However, Rita Fan Hsu Lai-tai, a member of the Standing Committee of the 11th National People’s Congress of the People’s Republic of China, said the SAR Government also has a responsibility for the flare of thoughts of Hong Kong independence. She stressed that the government needs to reflect. If these so-called “democrats” make a mess in Hong Kong, it will only increase the chance of success in the re-election of the current Chief Executive, Fan added. Lai Chak-fun said that now it is some local communists and hard-liners who criticize Hong Kong independence. Real Hong Kong independence has not seen criticism from the central government. This is the classic line and important theme of “Ten Years”. The movie displays the current social chaos in Hong Kong. Some members of the pro-establishment camp have made it clear that the more chaotic Hong Kong becomes, the greater the opportunity for re-election Leung will have. Faced with the Chief Executive election next year, some members of the pro-establishment camp, led by James Tien Pei-Chun, the Liberal Party leader, have indicated that they do not support the re-election of Leung. On the other side, fans of Leung recently stepped up their efforts to support his re-election. Some of the big names who showed support include Shiu Sin-por, head of the Central Policy Unit; Cheng Yiu-tong, honorary chairman of the Hong Kong Federation of Trade Unions; Lau Ping-cheung, former deputy director of the Office of the Chief Executive election; and Charles Ho, president of the newspaper Sing Tao Daily. Lai Chak-fun pointed out that unless the central government clearly opposes the re-election of Leung, Leung will definitely stand for election. Many netizens have posted messages saying that the unexpected victory of “Ten Years” touched them and made them feel that there is still hope for Hong Kong. One of the producers and directors of “Ten Years”, Ng Ka-leung, told Epoch Times that they had never expected to win the award, so they took it calmly. Peter Lam, chairman of Media Asia Group Holdings Limited, who has endeavoured to produce films in mainland China, spoke out against “Ten Years'” winning Best Film. He said politics has kidnapped filmmaking and film-awarding events. Ng said he couldn’t understand this comment. He said “Ten Years” has been placed in a very passive position, and they do not have the right to vote, so where is there “political kidnapping”? Because the HKFA system allows different voices, the final result is decided by voters. Ng believes that if this success gives a hope to Hong Kong people, the hope is that everyone can move one more step within one’s capacity to make a good choice. Then it will exert a positive impact on society. “When everyone makes a positive choice as to the dignity of human nature, or makes a decision on the basis of morality or ethics, human beings will have hope,” Ng said. “If Hong Kong people can speak out for justice, seek wellbeing for the public, and handle affairs in a fair and just manner, Hong Kong will have hope. “The five directors of “Ten Years” are trying to do well in their own jobs. “We care for the future of Hong Kong. From this starting point, and encouraging each other, we produced our creation step by step”, he added. Some analysts believe that “Ten Years'” prize-winning was attributed to the support of the public as well as some kind of subtle change in the Hong Kong entertainment circle, which has always been closer to Beijing. It is well known that the family of Zeng Qinghong, a central figure of the CCP’s Jiang faction, is rooted deeply in the entertainment circle of mainland China and Hong Kong. In fact, after the emergence of signs that mishaps had hit Zeng Qinghong and his brother Zeng Qinghuai, the entertainment circle, living on “Big Brother culture,” may carry out a reshuffle due to the collapse of these big brothers. In 2004, Hong Kong signed the CEPA agreement with mainland China, which opened the market of film co-productions. Owing to the pressure of finances and the market, many film directors and producers in Hong Kong moved their productions to mainland China one after another. Many bosses in the Hong Kong entertainment circle tried to build up a rapport with Zeng Qinghuai, special inspector of the Chinese Culture Ministry in charge of co-production. Though Zeng Qinghuai lived in Hong Kong for a long time, he had many relationships with the Chinese Culture Ministry. In order to curry favour with the CCP, some Hong Kong “Big Brothers” in the movie industry began to produce films to praise the CCP. For example, Albert Yeung produced a film titled “Beginning of the Great Revival”, in which Zeng Qinghuai served as Principal Advisor. Zeng Qinghuai, together with Li Dongsheng, former Vice Minister of China’s Ministry of Public Security, and financial tycoon Che Feng, also adopted “beauty diplomacy” and pimped for top CCP officials, including Zeng Qinghong. After former Chinese security czar Zhou Yongkang stepped down in 2014, Hong Kong star Jackie Chan’s son was jailed for drug abuse. Hong Kong media reported that the “iron triangle” in the Hong Kong entertainment industry consists of Zeng Qinghuai, Albert Yeung, the chairman of Emperor Group; and entertainment mogul Dong Ping. Moreover, Zeng Qinghuai got involved in the case of former Minister of Commerce Bo Xilai and Zhou Yongkang and became the number-one target of Xi Jinping’s anti-corruption campaign in the arts sector. When Che Feng, the son-in-law of Tianjin City mayor Dai Xianglong, was arrested last June, the Zeng family was implicated in the case. Last year, although Zeng Qinghuai was still included in the Officer list of the National Day Celebration Preparatory Committee of Hong Kong’s cultural sector, no one ever saw him. It was said that Zeng Qinghuai had been placed under house arrest. His daughter Zeng Baobao has been placed under control and thus repeatedly missed her listed company Fantasia’s performance conferences. In addition, Zeng’s niece, Wang Xiaoling, former secretary of the Guangzhou Commission for Discipline Inspection, has been publicly reported to have become involved in scandals. All of these signal that things are not going well for the Zeng family. Shu Kei, Hong Kong Academy for Performing Arts, School of Film and Television Chairman: “Ten Years’ winning is certainly a good thing. This award is elected by a lot of people. Do they really represent the public’s opinion? You see the response. A lot of people say ‘good'”. Legislative Councillor Kenneth Leung: “‘Ten Years’ well deserved the award. I believe that the judges made independent decisions. In recent years, a lot of things have made people feel more pessimistic. However, we can still see hope. We can still do better. We can maintain the values we are entitled to. If you give the people a real right to choose, it is, in fact, not so scary”.